Whether creating your own pizza, from an incredible choice of over 40 toppings, or choosing one of our 24 signature specialty pizzas, every order is prepared only after it is ordered! It takes a bit longer but is well-worth the wait. Every great pizza starts with a great crust! Our incredible, out-of-this-world crust is made with our signature, home-made dough, prepared in multiple batches throughout the day. Our dough is always fresh, never refrigerated or frozen. We roll it out to a medium thickness that stays crunchy on the bottom, but soft in the middle. It satisfies both thick and thin crust pizza connoisseurs alike. Click here to print our current menu with updated prices. 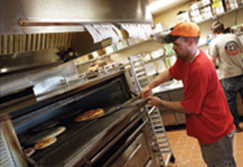 The employees of Bexley Pizza Plus are all cross-trained to be pizza chefs. So the employee taking your order may be the same employee that makes and bakes your order. They have thorough knowledge of our menu and the process of preparing our signature, award-winning pizzas. If you have questions or special request, just ask! 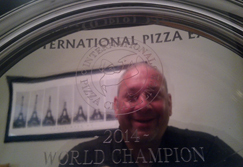 In March of 2014 Brad Rocco competed against 60 pizzaiolas from around the world at the 2014 International Pizza Challenge in Las Vegas. When it was over he won 1st Place Best Traditional Pizza In the World. His “Ultimate Pizza” wowed the judges and attendees at the International Pizza Expo. If you like pepperoni & mushrooms, you have to try this pizza! Copyright © 2019 Bexley Pizza Plus All rights reserved.